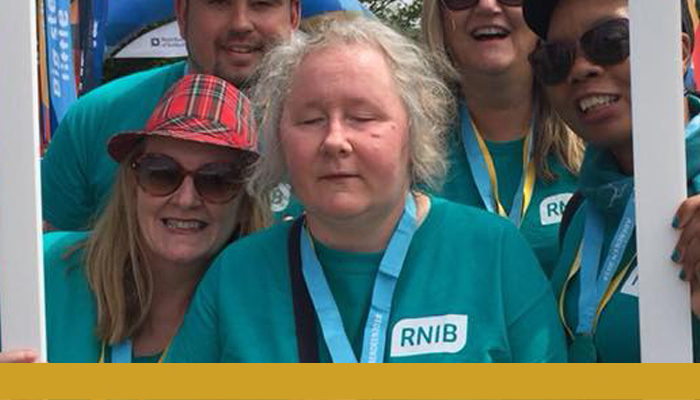 Find out why Amanda is encouraging people to take part in a sponsored event for RNIB. The Kiltwalks are held every year in Glasgow, Aberdeen, Dundee and Edinburgh. Jane, the community facilitator for RNIB Scotland said if I wanted to do the Aberdeen event that she’d be my guide. I got help in completing the form and setting up my JustGiving page, and joined Annette West’s team. There was an excellent atmosphere all day. Just before the walk, we did some warm up exercises. On the walk, we chatted all the time and I enjoyed every minute of it. After, we had some free food which was very welcome! Throughout the walk, I was treated as a person which doesn’t always happen in my life. I’m going to do the Edinburgh Kiltwalk too. I’d just like to thank the people walking with me as they made everything so enjoyable. I’d encourage anyone to do a sponsored event for RNIB.